Illuminare Fantastic Finish – Hall of Fame Worthy? Pros – the first liquid mineral foundation. Cons – not really any. Does it stay in the Hall of Fame? Is this My Holy Grail Eye Liner? From my favorite liquid mineral foundation makers, ILLUMINARE, comes a liquid liner that will rival them all. They sent me a sample of their Beyond Black Everlasting Eyeliner ($21 @ dermstore.com) late last year and I wasn’t aware that it had come out! Anyway, the formula is super soft and glides over the lid easily without tugging or skipping and it doesn’t irritate my inner eyelid! (I gotta find a name for that). And remember, like the whole line, this is mineral-based (are any of the others out there? ), waterproof and contains no parabens. And man, does this one last! Big recommendation. 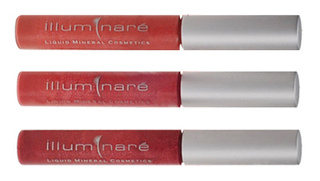 The ILLUMINARE line makes one of my all-time favorite foundations and they just came out with a line of mineral-based lippies - UltraShine Mineral LipGloss ($17) and All Day Mineral LipColor ($16). The UltraShine comes in five shades and the texture is like a thin lipstick. The LipGloss also comes in five shades and each color will accent, not overpower, any look. The only attribute I was not too wild about was the vanilla scent to these; smelled more like coffee, which I don’t drink. Overall, I like these but can’t wrap my head around the fact that they are mineral-based! Love that you are, again, setting a trend Illuminare. Both @ dermstore.com.